I have no idea what prompted me to do a search for Mr Yuk earlier today, but I’m so glad I did. In so doing, I reached way back into my childhood and connected with an icon that was plastered around our house (on the phone and toilet seat for starters). Created in 1971 (by the Pittsburg Poisen Center at Children’s Hospital of Pittsburg), and selected for being the most “loathed” by children in testing, Mr Yuk continues to be the face of danger some 37 years later!! 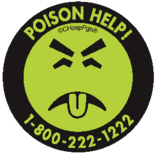 Mr. Yuk now bears the national, toll-free number to call in a poisoning emergency, 1-800-222-1222. Dialing the number routes the caller to the nearest poison control center anywhere in the United States.